Please send an email to X or call Y if you would like to receive information regarding the Mark-C test in the mail. Further announcements will be forthcoming on October 11th regarding additional markers that are included in the Mark-C test, ordering the test, participating in the National Outcomes Database Project and other confirmatory studies underway. This website will re-open on October 11th, 2007. Supposedly, the NeuroMark Mark-C test identifies two genes that increase the likelihood of treatment-emergent suicidal ideation in depressed outpatients on citalopram (Celexa in the U.S.), an SSRI antidepressant. These genes code for glutamate receptors, more specifically, ionotropic glutamate receptor subunit AMPA3 and ionotropic glutamate receptor kainate 2. Sixty-eight genes were chosen for study from among a larger list of plausible candidates... Genes were selected to sample five broad signaling pathways of potential importance in antidepressant effects: serotonin (20 genes), glutamate (16 genes), dopamine (three genes), norepinephrine (four genes), and neurotrophins (four genes), along with selected genes in other pathways (21 genes). A flowchart describing the study's progress is shown below. Since our primary case definition included individuals who scored only 1 (“I feel that life is empty or wonder if it is worth living”) on the “thoughts of death or suicide” item, we compared allelic and genotypic frequencies of the GRIK2 and GRIA3 markers in those with treatment-emergent suicidal ideation who scored 1 and those who scored >1. There were no significant differences, which suggests that all patients who scored over 0 are similar with respect to allele frequencies at the GRIK2 and GRIA3 markers. None of the participants with treatment-emergent suicidal ideation are known to have attempted suicide. Laje G, Paddock S, Manji H, Rush AJ, Wilson AF, Charney D, McMahon FJ. (2007). Genetic Markers of Suicidal Ideation Emerging During Citalopram Treatment of Major Depression. Am J Psychiatry 164:1530-1538. OBJECTIVE: Suicidal ideation is an uncommon symptom than can emerge during antidepressant treatment. The biological basis of treatment-emergent suicidal ideation is unknown. Genetic markers may shed light on the causes of treatment-emergent suicidal ideation and help identify individuals at high risk who may benefit from closer monitoring, alternative treatments, or specialty care. METHOD: A clinically representative cohort of outpatients with major depressive disorder who enrolled in the Sequenced Treatment Alternatives to Relieve Depression (STAR*D) trial were treated with citalopram under a standard protocol for up to 14 weeks. DNA samples from 1,915 participants were genotyped for 768 single-nucleotide polymorphisms in 68 candidate genes. Allele and genotype frequencies were compared between the 120 participants who developed treatment-emergent suicidal ideation and those who did not. 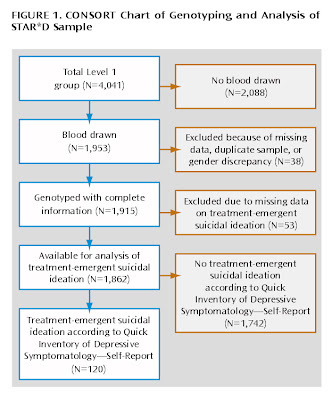 RESULTS: Two markers were significantly associated with treatment-emergent suicidal ideation in this sample (marker rs4825476, p=0.0000784, odds ratio=1.94; permutation p=0.01; marker rs2518224, p=0.0000243, odds ratio=8.23; permutation p=0.003). These markers reside within the genes GRIA3 and GRIK2, respectively, both of which encode ionotropic glutamate receptors. CONCLUSIONS: Markers within GRIK2 and GRIA3 were associated with treatment-emergent suicidal ideation during citalopram therapy. If replicated, these findings may shed light on the biological basis of this potentially dangerous adverse event and help identify patients at increased risk. Kylie Minogue as Lola Lovell in The Delinquents. The late Michael Hutchence of INXS supposedly wrote the song, Suicide Blonde, for his then-girlfriend. LOLcats in Your RSS Feed! I'm a Thinking C-List Blogger!